Ordinarily I would just blast this into the Twittersphere or Plus-space or whatever and be done with it. But it is too good to waste that way, even if it means this post is no more than a link. You will be unusually successful in an entertainment career. Unionville, NY to Duncannon, PA: Pennsylvania Rocks! I’m fully a year behind in these updates, a delay I never expected would happen (or that, if it did happen, I would still be making updates at that time). I’m surprised I can still remember this many details, but on the other hand, why would I have forgotten them? It might have been routine after a few weeks, but it was not routine without variation: every day had new goals, and nearly every day (save zeroes) had a new destination and distractions along the way. The few pictures I took and the trail description in the Companion have also been a significant aid in remembering more than might be expected. On a perhaps more positive note, I’m well past the chronological halfway point with my entries now! I have 58 days of hiking left to Springer Mountain from Duncannon, which shows how much faster I’m hiking now. In these last 58 days I’ll cover 77% more miles than I did in my first 58 days. 🙂 (A more meaningful comparison would ignore startup time, but even comparing the immediate past 58 days (including the eleven here) to the last 58 days I’ll have covered 38% more ground.) The physical halfway point is still a couple days away, and the traditional psychological halfway point (Harpers Ferry with its ATC office) is about a week or so out yet. I’m up late the past night working on my thru-hike updates here, so I’m more than a little tired when I wake up this morning for breakfast. As with the past night’s dinner, it’s adequate but not large. After the usual slowness about getting out and starting hiking, it’s back on the trail again from where I left off at the road into Unionville. Hiking starts off slowly, but it’s slower for others than for me as I catch up to SOBO Scottie (Chatterbox) after a few miles; he’d been dropped off a couple miles up the trail ahead of me. Today he’s only hiking out maybe fifteen miles or so, and he’s going to have Butch pick him up and drive him back to the Mayor’s house for the night again, so his backpack is only loaded with what he needs for the day. I, however, hike with my full pack, which is heavier than usual because I just resupplied. I didn’t start the trail intending not to backpack it, and I’m going to keep carrying a loaded backpack with me the entire way. Given the extra weight I’m in no rush to hike quickly, so we continue hiking together at a semi-leisurely pace for a pair of thru-hikers, which is probably still faster than most day hikers. 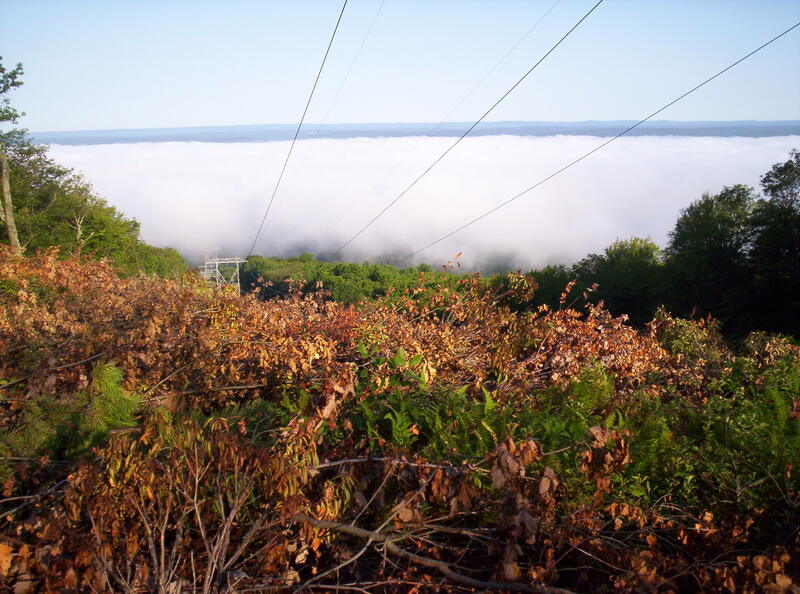 The first main attraction of the day is the highest point in New Jersey, imaginatively named High Point. At 1803 feet it’s not exactly the most inspiring state high-point I’ve ever visited, not even on this hike so far (Katahdin and Mount Washington each having elevations more than triple this one). 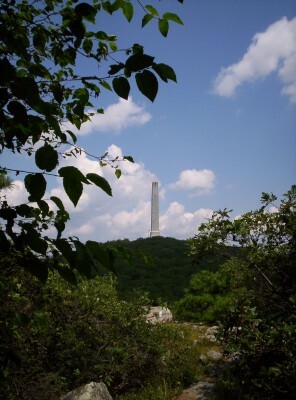 The A.T. doesn’t quite pass over this highest spot, but a few tenths of a mile on a side trail takes us to the highest point, topped by the High Point Monument. 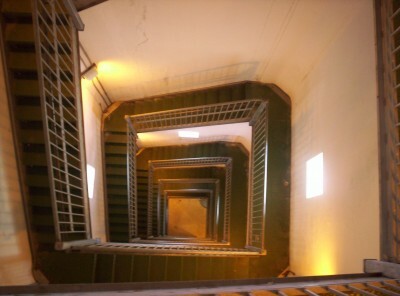 The monument and its views (both out and down) are fairly impressive, and they certainly make this high point more memorable. The monument was constructed around the end of the 1920s as a tribute to New Jersey’s war dead, upon land donated to the state for use as a park in 1923. It’s in good shape, having seen a reasonable amount of upkeep over the years (although the same cannot be said for a mansion that resided in the park, torn down years ago in response to neglect by the state). Curiously Wikipedia claims one plan would have closed the park on July 1 before I reached it, in a bid to cure New Jersey’s budget woes, but veterans groups staved off the proposal. I presume they would have stopped paying employees to work at the park and the monument would have been closed while the trails would have remained open, but it’s impossible to say exactly what the effect would have been on thru-hikers passing by. Thru-hikers have certainly had to deal with worse problems in the past (particularly on such trails as the Pacific Crest Trail that pass through dry, hot areas, for obvious reasons). 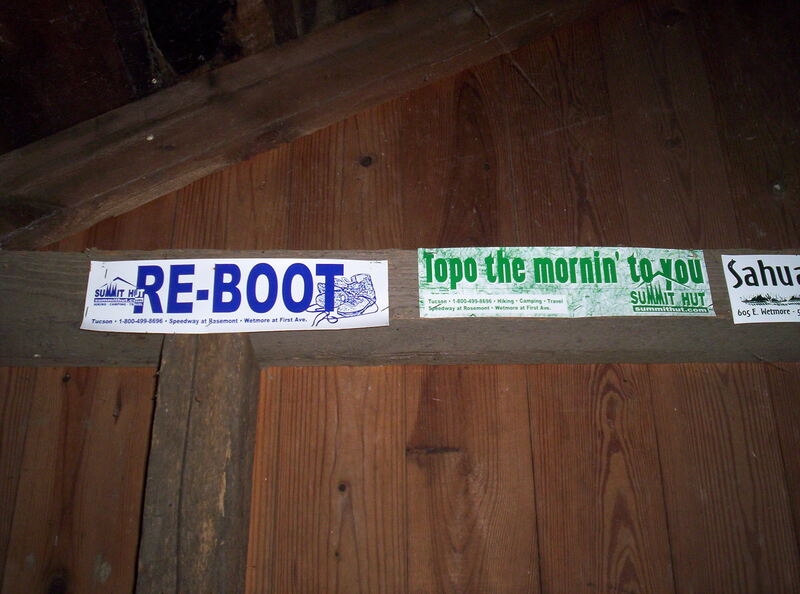 When I reach the bottom again I notice my boot sole is coming further undone, so I stop briefly to pull out duct tape and attempt a makeshift repair, wrapping around the bottom and up onto the sides of the boot. I’m not expecting it to work well, but it actually functions admirably at holding the boot together; I suspect much of this is due to the threads running through the duct tape, combined with the care I use in pushing the duct tape into the tread on the sole of the boot. They’re clearly dying, nearly dead, but I should be able to get a little more use out of them before they die. It’s not much after passing High Point that we reach the park headquarters to make our exit from park lands, and just in time, too, as it rains briefly while we take shelter in the headquarters. SOBO Scottie uses his cell phone to call and arrange his pickup at the end of the day, and I briefly borrow his phone to call home and clarify some arrangements for family to send me a package on the trail. Last night while working on trail updates I also sent an email to family asking them to ship me a bivy sack to replace my tent; it’s become clear that my habit of shelter-hopping means that the tent is unnecessary weight (but more importantly volume, since it’s a one-man hoop tent that only weighs around two and a half pounds) most of the time, and I’d be better off with a bivy sack. I’d even have the ability to use it in shelters to keep off bugs if I wanted — functionality which would have been highly appreciated at Tom Leonard Lean-to in Massachusetts. My email proposed a range of towns in Pennsylvania to which to ship it — Delaware Water Gap 50 miles south, Wind Gap 65 miles south, Palmerton 85 miles south, and Port Clinton 130 miles south. Having never had anything shipped to me before on the trail, unlike some, I have no idea how many days to give the package to arrive, so I tell them to pick one and I’ll call and find out which. When I call I find out they’re at the store buying extra stuff to fill up the priority mail box they’re sending (a flat rate box, so wasted space is wasted money); based on conversations with others I’ve found out Palmerton should give adequate time for it to arrive, so I instruct them to send it there. On the ride back Butch mentions that he needs to pick up a sick (likely having Lyme disease via a tick bite, given his overall lethargy) hiker from Greymoor tomorrow morning, so he’ll have to do that tomorrow morning before driving us back to our dropoff site. 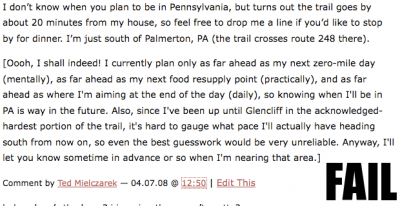 We get back, have dinner, and meet the other hikers who’ve just arrived: Slowpoke and Asgask have caught up after taking a break off the trail a couple states back. (I think they’re the only ones, but I may have missed someone.) The night winds down, and I head to sleep knowing it’s going to be an early wake-up for breakfast, then some delay for Butch to drive to Greymoor and back, then (finally) time to head back to where I left off yesterday. I spend most of the day sitting on a couch in the living room reading and watching the Olympics, including (if I remember my chronology correctly) the rather improbable spectacle of two gymnasts (American and Chinese) with identical final scores being given different medals (American silver, Chinese gold). Oddly, it seems that the rules state that when identical final scores are determined, a tiebreaking algorithm then considers the makeup of the scores of the individual judges, such that more higher scores offset by fewer but more negative scores is more likely to win the higher placement. Rules are rules for this time around, so there’s nothing to be done now (and in any case the American won a separate gold in a different event, so it’s not as though she were “robbed” of her sole gold medal), but this strikes me as fundamentally wrong. A final score is an aggregate measure precisely because individual judge scores are not considered consistent, reliable, or trustworthy enough to determine a winner — so why should this change when a tie occurs? Practically, it also causes aggregate scores to not actually be “scores” in a useful sense of the word in these rare cases; the announcers were as confused as any of the viewers at precisely why reported-identical scores could result in different medals. The rationale was to avoid handing out multiple instances of the same medal, but I see nothing wrong with handing out multiple gold medals, or multiple silvers, or multiple bronzes in the rare cases when such occur, if the scores don’t have the precision to differentiate two competitors. If you must break the tie, do it the way most sports do and hold a tiebreaker contest — but don’t draw meaning out of numbers not generally deemed reliable enough to have individual meaning. Around mid-afternoon Slowpoke and Asgask head south again on the trail, and in from the north arrives Sweet Sweet again! As in the past he expresses surprise at seeing me given my pace. I hand off Charlie Company to him to read after he expresses interest in it when I mention having finished it; presumably he finished it and now it’s somewhere south of Unionville in an A.T. shelter. This time at the Mayor’s house is the last time I see Sweet Sweet on the trail; my memory from some completion list I’ve seen is that he completed the trail hiking with Hungarian, but I’m not 100% sure. He definitely was hiking behind me for quite awhile after, going by rumors I heard while hiking. Between reading and eating another half gallon of mint chip ice cream today, it’s a pretty slow day in which I relax more than anything else. After the night’s dinner I round out the day by watching The Fugitive, which some of the others have started watching in the basement, and then head to sleep. I didn’t get anywhere, but I refreshed myself to continue hiking south again in earnest. Given that I’ve finally started to make good distance fairly consistently, I’m sure my mileage deficit will disappear easily — and if I’m wrong, I’m certain I’m not off by so much that an extra effort at the end couldn’t close the gap. Hiking continues along to the Culver Fire Tower, at which either we catch up to Slowpoke and Asgask or they catch up to us (I think it’s the former, not sure). 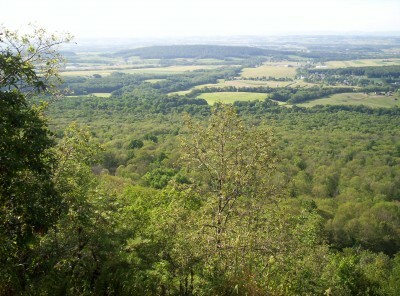 It’s a nice view of the surrounding area; we’re walking along a small ridge with views off to both sides into New Jersey and Pennsylvania. A couple miles further on the four of us reach US 206 and Culvers Gap, where we scatter slightly to get food. There’s a little store called Joe to Go that I might have visited, except that reports north on the trail in shelter registers suggest the owner is very unfriendly to hikers. Instead I wield my economic might to get a BLT sandwich from Gyp’s Tavern several hundred feet down the road from the trail, which, sadly, is up for sale; hopefully whoever buys or has bought it continues to run a restaurant that hikers can visit. Hiking is mostly uneventful until I catch up to SOBO Scottie again as he sits on the trail looking out to the west at Pennsylvania. He mentions that he has a travel container of Gold Bond which I might find useful; I file the knowledge away for later as I find the pain is mostly gone at this point. 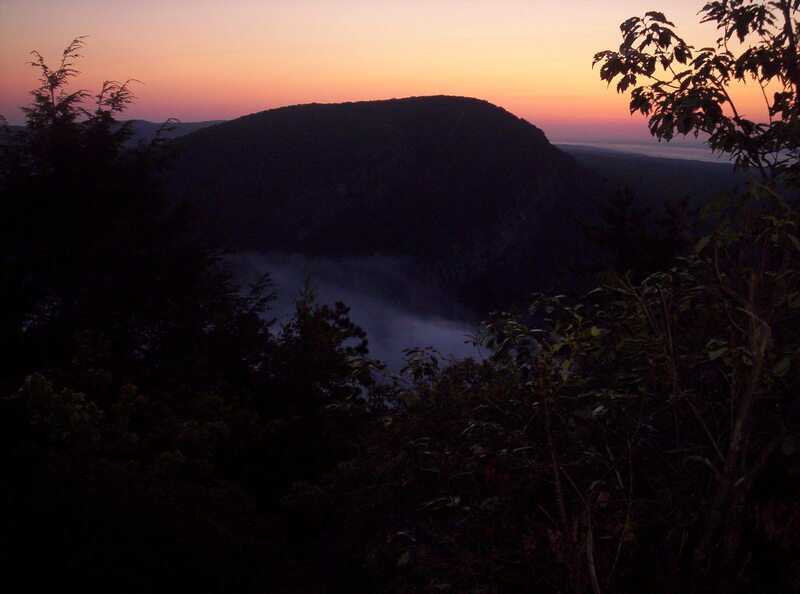 We continue south, entering Delaware Water Gap and the last twenty or so miles of trail in New Jersey. 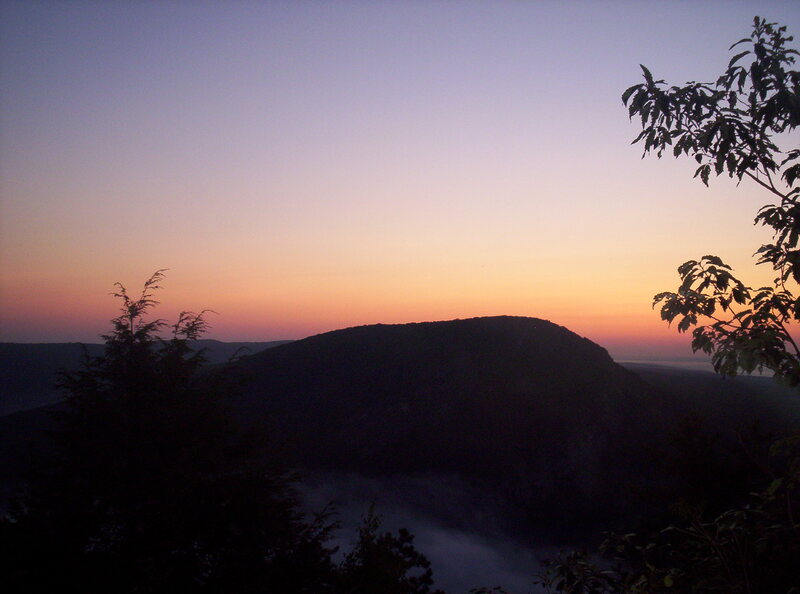 The nice thing about the DWG is that, unlike the rest of the last four states, you aren’t restricted to camping only in the places The Man tells you to camp, at least not if you are a “through hiker” — which they define as camping for more than one consecutive night. (Does seventy-three count? 🙂 ) It’s still a little limited in that it’s only between fifty and a hundred feet from the trail on either side and at least half a mile from roads, but it’s enough to give me as much flexibility as I need, so I’m happy with it (especially after 280 miles of restrictions, stupid New Englanders). It’s nearing the end of the day (and daylight) as we pass Blue Mountain Lakes Road; it’s only half a mile to a claim of large open spaces adjacent to the trail, perfect for setting up tents. We put out ten minutes of effort over fairly level to travel about a half mile before stopping. I pull out my stove and cook, while SOBO Scottie more or less drops down, rolls out a sleeping bag and pad (no tent, just “cowboy camping”), and crawls in. We may be in a national rec area, but something’s hopping across what’s apparently Fairview Lake to the east of us, as though some sort of high school band were playing. Whatever it is, it has extremely eclectic taste: I hear both Amazing Grace and potential drum solos. I pull out my pad and bag once I finish eating, and sleep follows shortly at the start of a beautiful night. We get an early start the next morning as SOBO Scottie gets up early to watch the sunrise to the east of us over the lake. What I caught of it looks pretty, but I’ll take the little extra sleep instead. 🙂 We’re up and out by 7:30, which is not especially early for thru-hikers but which is probably earlier than I generally rise. Before we head out SOBO Scottie gives me the Gold Bond he’s carrying (which I put to preemptive use, and it works wonders — never again will I hike without it on a thru-hike): he’s decided he no longer has the drive to complete a thru-hike, not since the wedding where he revisited civilization, friends, and family, so he’s leaving at Delaware Water Gap at the end of today’s hiking. I make a little effort to convince him not to, but it’s pretty clear he won’t be dissuaded. I drop my camera on the rock I’m sitting on while adjusting myself to take that picture. The camera screen turns a rainbow of colors, and I turn it off and hope it works when I turn it back on, which thankfully it does. Roughly here we begin the descent from the ridge down into the valley. Miles pass quickly; we get into discussions on a variety of subjects. Of course, given the time in the national election cycle, public policy and the election figure prominently. Among the topics we discuss are vice presidential picks, this being before either candidate had made a pick (I think; Obama might possibly have picked Biden by this time). I try to pitch my preferred Republican veep candidate, although given the lack of attention paid to him I’m pretty sure he isn’t going to get the nod (and he doesn’t), describing his best attributes, among them a willingness to stubbornly restrain government spending against heavy opposition. Who is this candidate? Well, ironically…suffice it to say he’s best known these days for “hiking the Appalachian Trail”, not for being a potential candidate for any elected office. So it goes. 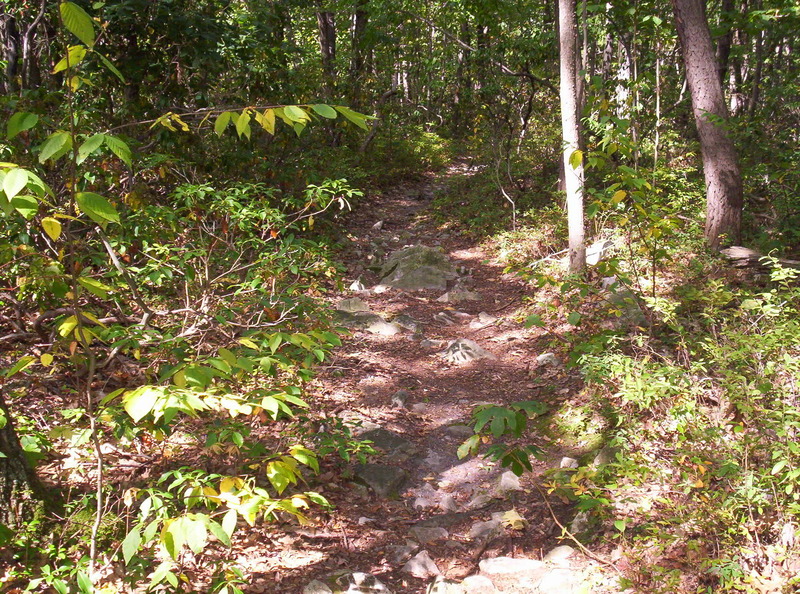 Eventually, we reach Sunfish Pond, which the Companion describes as the southernmost glacial pond on the Appalachian Trail. It’s a great-looking pond, but no swimming, as it’s apparently pretty fragile. 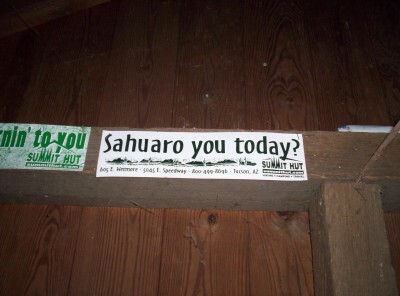 We start meeting a lot more people while hiking around here, given the proximity to civilization. The two of us briefly stop and talk to a cross-country group from a college in Bethlehem, PA, perhaps forty or so miles away. We also pass by the northbounder Dred Mamma; she’s the last full-blown northbounder I saw on the trail. The northern end of the trail has an effective cutoff date of October 15 for hiking Katahdin, due to wintry weather at the summit; hikers are encouraged to get there by October 1 to be safe, because the weather is hit-or-miss at that time of year and the trail may be open as often as closed then. For anyone behind Dred Mamma, that’s fifty-four days of hiking to reach Katahdin with no leeway at all, going through the most difficult portion of the trail for the last four hundred of it. 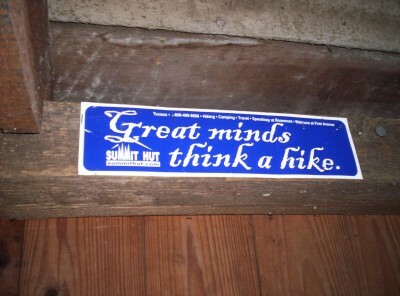 Therefore, by this point most of the slackers make the pragmatic decision to not do a one-way hike. Instead, they flip up to Katahdin and hike south from there, back to wherever they left the trail. This affords them considerably more flexibility, at the cost of not quite being able to say they hiked non-stop directly from one end to the other. Putting it bluntly, however, it’s often their own fault: the slower northbounders are often the ones holding up the party scene who allow themselves to get stuck in towns longer than necessary to keep a good pace. 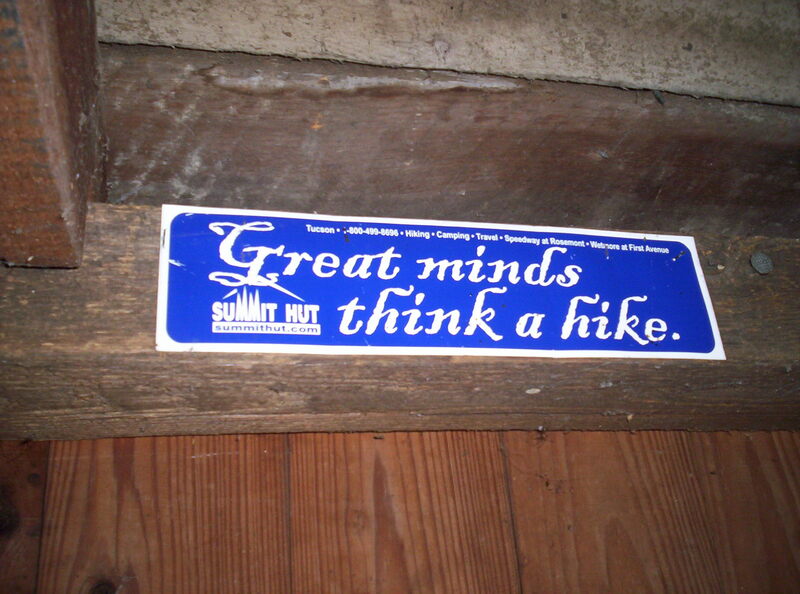 I wouldn’t mind — hike your own hike — except that the party-animal thru-hikers do a good job of giving the rest of us a bad name. After crossing the bridge it’s only a couple minutes’ walk to the Presbyterian Church of the Mountain Hostel (give you one guess who runs it). I drop in to see SOBO Scottie already there, of course, along with Slowpoke and Asgask. As it turns out, I’m going to be the only person heading south from here; SOBO Scottie is bowing out, and Slowpoke and Asgask are going off-trail yet again to visit family. I decide to grab lunch and see what the options are for getting a new set of hiking boots before I continue south again. Palmerton is thirty-six miles south of here (plus over a mile of walking into town and to wherever the post office is), and since today’s Thursday I’ll most likely be arriving Saturday, which means I have to get to the post office before it closes at noon. 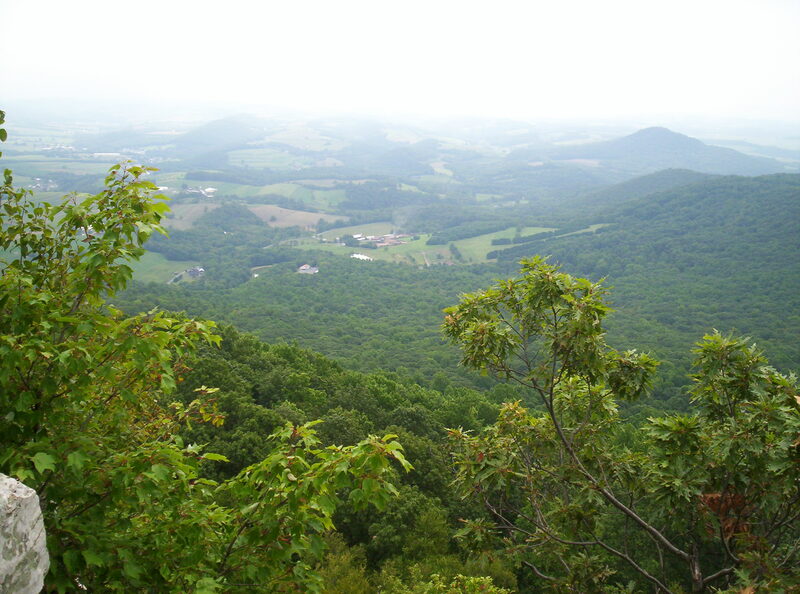 The easiest way to do that is to hike further today (six miles to Kirkridge Shelter, or more or less to a non-designated site), put in twenty or so tomorrow, and make up what remains on Saturday morning. After dropping packs we head into town to Doughboy Pizza, where I casually order a large pineapple and ham pizza and a bottle of Guinness to go with it. The pizza arrives shortly — all 16 inches of it in diameter. Well then; I know I’m capable of eating quite a bit, so I might as well see how far this can go. I discover to moderate surprise that, eating deliberately, a 16-inch pizza is pretty much the perfect amount for me to eat. I get up at the end of it and walk out feeling full but not so full that I have to slow down; it’s great! Next stop is an outfitter a few blocks further down the road which turns out not to have boots, then it’s to a gas station where I pick up some pop-tarts and candy bars as food/snack items until Palmerton. I last stop at the outfitter almost across from the church to see if they have hiking boots; they have four pairs of trail runners in three models. 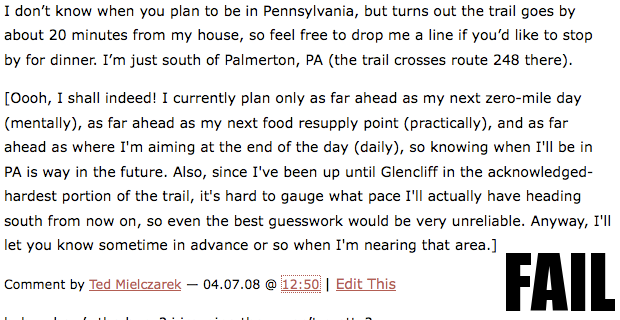 (Pretty much everyone is in trail runners, and especially since I’m out of the hard part of the trail I probably don’t need anything heavy-duty.) I try a pair of Salomons on, which I’m told some people swear by; I find the soles are thin enough that I can feel even small Pennsylvania Rocks! underfoot in the driveway outside when I give them a test-walk (which will only get worse as I hike further into Pennsylvania, which is — have I mentioned this already? — famed for its Pennsylvania Rocks!). I try on another set of boots, but those have an oddly-shaped toe box that doesn’t fit me, so they’re out. The remaining model is a Vasque, which I’d hoped to avoid given that my current pair are Vasques and I haven’t thought they’ve done very well (and, judging from what others have said, Vasques from this year have been pretty low-quality). However, I probably don’t have a choice; the next outfitter isn’t for 75 miles, and I’m kind of pushing it now with the duct tape. The outfitter has two sizes; one size is too small, but the other fits just about perfectly. They feel a little weird around the tongue, but I get them anyway: first, I’ll probably get used to it without any trouble, and second, my feet barely ever get blisters, so it’s not critical I get exactly one particular exact fit of boots. (As it turns out, the new boots work great, so great that I never actually needed to get another pair; I was expecting them to last maybe 800 miles or so given their less-sturdy construction. In fact, I still have them and wear them at the office these days as something to change into from bike shoes with cleats in them.) I walk out with new boots and back to the hostel, where I promptly leave my current boots, duct tape and all, in the trash. I did get ~950 miles out of them, but given how quickly they began to fall apart, I’m disappointed. 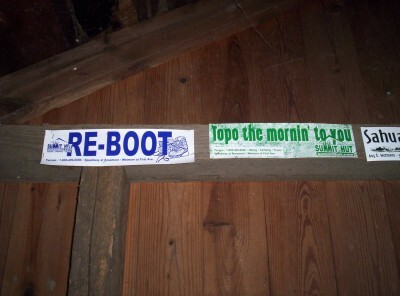 I later learn that my new boots were last year’s model (2007), while my old boots were this year’s model (2008). Vasque apparently changed an upstream manufacturer in that time, which caused the massive reduction in quality. I wouldn’t be at all surprised if they changed back judging from my experience and that of others I heard; they should get feedback to that effect through vendors with good return policies. Then again, most people don’t think about how far they’ve worn boots to notice premature wearing, given the much longer time frame for use, so it’s possible only thru-hikers will really notice, which would be rather unfortunate. 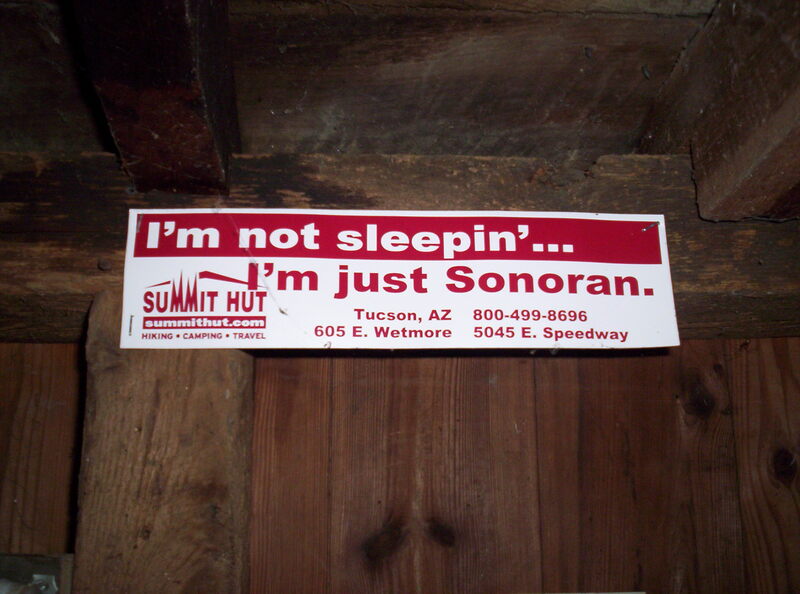 By now it’s getting late in the afternoon, and on Thursdays the church has a potluck and invites hikers to it! I decide I might as well stay a little longer to grab something to eat before heading south a few more miles. I fill one plate with food, none of it of a notably filling variety, and assume that leaving it at that shouldn’t be a problem. Halfway through the plate, I realize it is — and a big one. In the space of minutes I go from comfortable to feeling like I’m going to burst if I eat anything more, or, more worryingly, if I move at all. In this condition there’s no possible way I can hike any further today, not without leaving half of what I’ve eaten on the trail somewhere, so I resign myself to spending the night and making today a short day; tomorrow and the day after will just have to be huge to get to the post office by noon. I could do much worse for a place to stay, and it’ll be nice to sleep inside, but still…I needed to make more progress today. :-\ Maybe tomorrow will be a gangbusters day if I wake up and get out early. I wake up at 4:30 wondering why I’m awake. It’s dark outside, and I consider rolling back over to get another hour or so of sleep, but I don’t really feel tired. Clearly, this is an opportunity to knock out that huge day I’d started considering after yesterday’s crash and burn at the end. I pack up my backpack and head out to start hiking at 4:50. It’s very dark outside as I start hiking, without even the slightest hint of daybreak, and my head lamp is put to immediate use on the trail, which climbs back onto ridges on the eastern side of the Delaware. There are several nice lookouts, and sunrise colors make it pretty awesome; the pictures give you an idea, but if you look at any of them you’ll notice areas in shadow don’t have much in the way of detail, due to the cheapness of my camera. Most of the time I can’t see the horizon through the trees, but it doesn’t matter; I’m up early making good time, and the temperatures outside now are much better than they will be in the middle of the day with the full sun overhead. I make good progress to arrive a little over six miles south at Kirkridge Shelter around 7:30; I probably would have been faster with daylight the whole time, but no big deal. It’s only about thirty miles from here to Palmerton, and I have plenty of time. I stop and read the shelter log as usual; one entry is from a guy noting that he stayed the night drinking some beer he carried up, and almost the very next entry is a strident note from maintainers that alcoholic beverages are absolutely forbidden on this section of trail. The way I see it, if you pack it in, pack it out, and don’t make a nuisance of yourself (it sounds like this guy didn’t), why shouldn’t they be allowed? I’m sympathetic to the idea of a prohibition to avoid trouble, but I’d ultimately rather see it on an individual-spot basis rather than a whole-section basis. From here the next ten or so miles are extremely bland. After a road crossing I encounter one of the longest un-featured stretches of the trail where no attractions are mentioned by my Companion, Wolf Rocks to Wind Gap, 903.4 to 910.4, seven miles of hiking with little of note. I have mentioned the Pennsylvania Rocks! before, which seemed to strike fear in the hearts of even the sturdiest northbounders; here they hit with full force. As mentioned before they’re usually about brick-sized, and they require somewhat more effort when establishing footing. The scare stories were that you might only make ten miles in a day over them; I’m clearly moving half a mile an hour slower or so, but they aren’t actually presenting real difficulty, just tedium. The other special part of this section of trail is that it’s late summer and water sources are starting to dry up. I fill up at Kirkridge to make it to Wind Gap, where the Companion takes specific note of a motel that will fill water bottles; if you don’t fill up there it might be a fifteen mile walk without being able to get water, which is doable but starting to stretch it (especially if one considers that that much water is heavy). By now it’s mid- to late-afternoon, and if I want to get distance in I have to get hiking again. (This is a common theme, that I spend an inordinate amount of time during days not hiking but sitting in shelters reading registers.) I turn on the speed and get a good three mile an hour pace going to finish out the day. I note with some feeling of accomplishment when I pass a side trail that indicates I’ve walked a full marathon’s distance today, but now the goal is to reach thirty miles. An hour later and it’s about 20:30 and I’m hiking in darkness, but based on time estimates I’m at thirty miles of hiking for the day, so I start to look for a small spot to pitch the tent (while mostly avoiding the omnipresent Pennsylvania Rocks!) 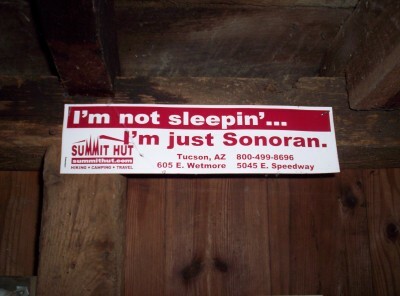 and head to sleep. I eventually find a great little spot, where I set up the tent, cook and eat dinner, hang a bear bag, and go to sleep for the night. Thirty miles! May there be more such days to come. I sleep in a bit today, which means I don’t really wake up until 8 and don’t start hiking until after 8:30. I’m probably cutting it a little close; I have six miles of hiking to reach the road into Palmerton, and from there it’s another two miles to the city itself. (There’s also an alternate route that’s less than six miles of hiking plus two miles down a side trail, with the big difference being there’s no possibility of a hitchhike on the side trail.) That said, as long as I keep moving I should be okay. I reach the next road crossing, Blue Mountain Road at Little Gap, just after 9. I haven’t been able to refill on water since the motel, and someone’s left a few filled water jugs at the roadside, part of whose contents I greatly appreciate. I have enough to make it to Palmerton, to be sure, but this extra should make the remaining miles comfortable rather than thirsty. 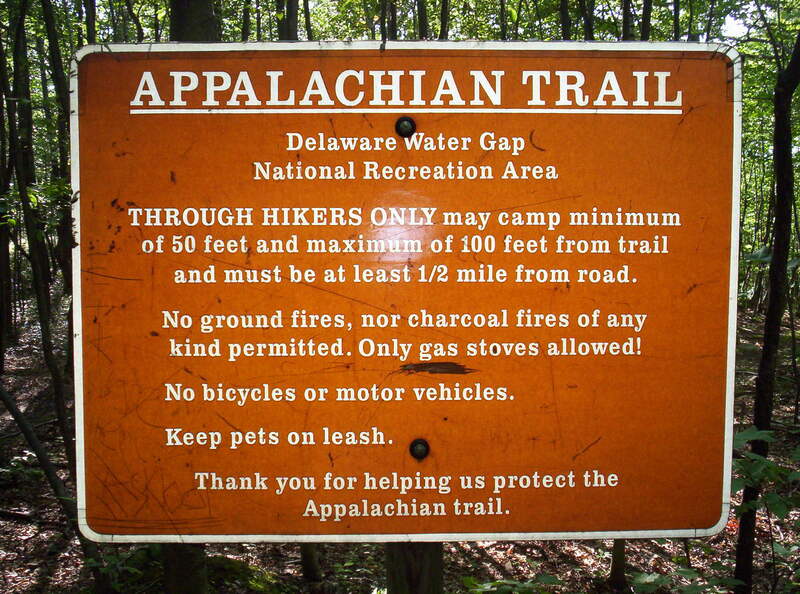 Ironically, this is in the state whose road crossings contain the most prominent notices proclaiming that trail magic, the leaving of helpful snacks and the like on the trail for passing hikers, is prohibited. This is ostensibly to prevent littering; it also would theoretically eliminate problems with wildlife being attracted to trail magic and making a mess of it (think a cooler full of pop, for example). However, there are problems: first, the prohibition on trail magic will never be publicized well enough so that no one does it accidentally; and second, littering isn’t really an issue anyway as trail angels are careful to leave garbage bags and similar to put empty cans, wrappers, and such (at least at the trail magic I passed). This does leave the wildlife concern, but I’m not certain how much of a problem it really is, nor am I certain trail angels couldn’t address this problem if necessary. 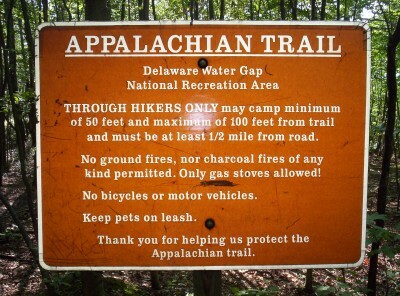 In the end, however, prohibiting trail magic doesn’t make hikers happy, it doesn’t make would-be trail angels happy, and it means more hassle for trail runners who keep an eye on the trail in the area. There’s a small register at this crossing, so I spend awhile writing up a request for the institution of a permit system for trail magic which, aside from bureaucratic hassle, would be worlds better than the current flat prohibition. It would allow the ATC to control what’s out there, control the conditions in which it’s placed out there, be able to determine responsibility for resultant litter, allow people to do what they’re going to do anyway because they don’t know they shouldn’t, and not penalize minor unintended mistakes. It might or might not be more effort than the current system, but it would absolutely make a lot of people much happier. Would it ever be implemented? Probably not, but it’s at least worth advocating for it. By now it’s 9:45, and the necessary “keep moving” mantra of earlier is now practically an imperative, with seven miles remaining to Palmerton including the road at the end of the section of trail. Even more fun is that these five miles are up and over a mountain, so a slower pace is to be expected. However, there are a few mitigating factors. The first is that the trail officially goes over the mountain, but that part of the trail is closed and replaced with a trail that carves across the side of the mountain for the moment. (If you’re curious why the trail’s closed, this overhead picture should help to illustrate why. To make a long story short, Blue Mountain was the site of a zinc smelter up until 1980, and it seems the owners weren’t particularly concerned about not contaminating the lands, leaving the cleanup externality to someone else — which now seems to be the American taxpayer. Since 1982 the site has been an EPA Superfund site as they attempt to clean it up and make it usable again; it’s not clear to me what the success condition is in this effort, nor is it clear how much longer it will continue until the actual trail can be reopened.) The second is that with this carving I can occasionally make both flat-terrain and downhill progress at a loping gait, not a run but easily faster than a walk. I reach the side trail to Palmerton at 11:20; I have supposedly two miles (actually 2.6 by the route I eventually took) to cover before noon lest I turn into a pumpkin and have no idea what to do about the mail drop family has sent me here. From here the trail to Palmerton gets interesting. 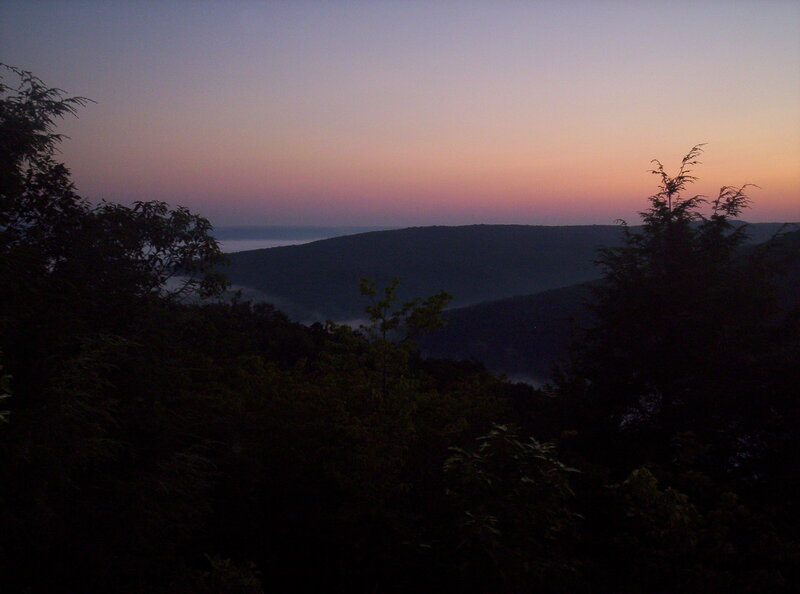 It’s about ten or fifteen minutes of sometimes-running down the side trail until I reach a parking lot, after which I continue a few minutes down the road to it paralleling the creek that runs just southeast of Palmerton. I continue my half-run, half-fast-walk eyeing my watch as I go. Supposedly the road passes over a bridge that will take me into town, but aside from railroad tracks that don’t quite look intended for that use I’m not seeing anything. However, the creek’s not deep, and I don’t know where the post office is in town anyway, so eventually I decide it’s time to cut across even without a bridge — across the creek I go. It isn’t deep at all, and once I climb up the bank on the other side and onto a side street visible from the other side (6th Street if I’m matching the overhead view to memory correctly) I start running north toward the main street, hoping to pass someone on the way who knows where the post office is; it’s about 11:48. Quick directions tell me it’s half a dozen blocks west, which I continue to alternately run/walk, looking ridiculous the entire way, I’m sure. Eventually I reach the post office, walk inside, and get in line — 11:59, and a minute after I arrive the doors close and the line empties out in front of me. I get my box, quickly empty it, put my tent inside it, package it up again, pay for shipping back home, and hand it over to them — mission accomplished. It turns out that if a package is USPS priority mail, which is what’s overwhelmingly used for mail drops, you can have it forwarded (to another post office, for example) for free as long as it hasn’t been opened. It’s also possible to call the post office to have a package forwarded without having to physically go there. However, I didn’t know either fact at the time, so if I hadn’t made it to the post office in time, I might have been stuck around Palmerton until Monday. I’m understandably rather exhausted at this point, so I head out and across the street to a gas station, where I pick up food and something to drink, which I eat after walking back along the main street to the city park. Once I finish eating it’s time to get back to the regular chores, so I head to the grocery store and resupply, grabbing some extra apples and yogurt for a little more snack. After a call home and a brief time packing up supplies, it’s a walk back in the direction of the post office to figure out how to get back to the trailhead via the, er, non-bushwhacked route. I’ve had enough of the side trail; this time it’s the road for me. The road turns into highways very quickly, with no obvious path through them, so I’m fortunate to have someone offer me a ride back to the trail. A brief walk across the bridge over the Lehigh River and it’s back on the trail again by mid-afternoon. The rest of the day’s hiking proceeds mostly without event. The trail to the first shelter south, the George W. Outerbridge Shelter, is liberally spotted with what appears to be painted-over graffiti. When I arrive at the shelter and read the register I discover the mess created by “Britney” (I believe that was the name, but memory is slightly hazy) is being cleaned up; the painted-over Pennsylvania Rocks! are apparently part of that process. A couple other entries leave some words for “Britney”; I agree with the sentiments, but I’m not sure they’re occupationally or anatomically accurate. It’s too early to stop, and the graffiti has soured me on the area anyway, so I continue roughly seven more miles to Bake Oven Knob Shelter, arriving only a minute or so after I’m forced to admit I need to dig out my flashlight to continue hiking. (I judge my progress well enough to know that if I can go “just a little further” I’ll reach the shelter, but when I can’t distinguish the Pennsylvania Rocks! from each other any more I have to admit defeat.) The shelter has a plywood floor, as did Wiley Shelter in New York; it’s really only with this shelter that I realize that there actually are materials whose quality (even if the particular specimens are excellent) is so low that they shouldn’t be used in building shelters. Stone, logs, and machined lumber are all most certainly fine, but plywood just can’t cut it (mostly due to its tendency to warp). There are a couple other people at the site but not in the shelter, and interaction with them both tonight and in the morning is minimal as I cook dinner and head to sleep. My pace today was below average, but given the madcap rush to Palmerton in late morning, my lengthy break there, and my thirty-mile day the previous day, it was good enough — lots of time and miles in which to make it up. This section of Pennsylvania passes along ridges through what is apparently great birding country. 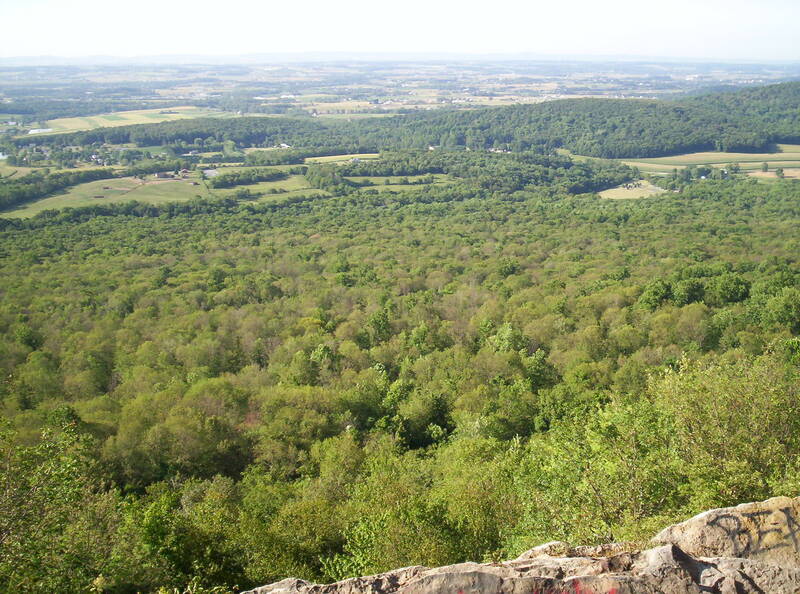 My first stop for the day is at Bake Oven Knob itself (I stayed at its shelter last night), where I encounter half a dozen or so bird watchers. More accurately, they’re counting hawks in the area, watching them soar on wind drafts. They say they count hawks regularly, keeping track of the largest number of distinct individuals seen of each species, a statistic I believe they said their group has recorded (with precisely the same metric the entire time, so meaningful comparisons can be made for that entire time) for over fifty years. 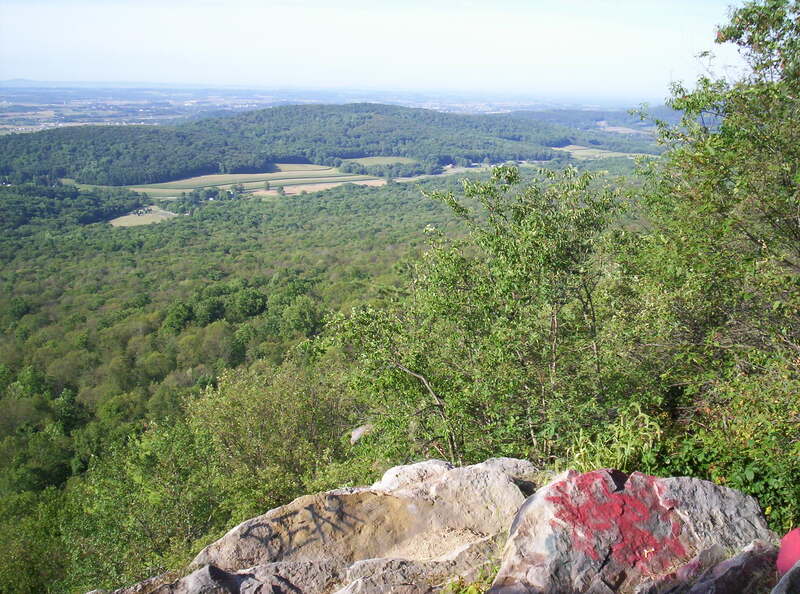 I sit and watch the raptors gliding for a few minutes, dangling my feet over graffiti-covered boulders (I have come to expect nothing less of Pennsylvania), before continuing on. Trail this morning is fairly mundane: ridge walking, a brief view from Knife Edge, much walking over Pennsylvania Rocks! on the trail, and no water in late summer in an area in which sources were scarce to start. Water arrives again at the Pa. 309 road crossing, where a restaurant with an outside spigot lies slightly off-trail to the west. After filling up it’s on four miles to the Allentown Hiking Club Shelter, where I stop briefly to read the register; a family stops at the shelter, apparently for the night, as I sit. It’s far too soon to stop yet, so I head on into a bland 7.4 miles of trail in which the Companion notes no features of interest save for the meeting point of three county lines a little over a mile in from this end. Generally I find that any section of trail more than three miles is longer between trail features than I’d prefer; I like getting progress updates at least every hour or so. After the corner today it’s 6.1 miles of apparent nothingness, and while I can estimate distance covered based on what I hope my pace is, I’m not confident enough in my judgment to say with much certainty. 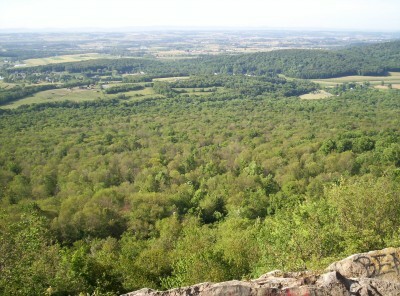 As it turns out there’s one feature, a viewpoint called Dans Pulpit, that should have been listed (and, if they listen to my feedback, it will be in future Companions), a couple miles or so before I descend to Hawk Mountain Road, a couple tenths of a mile east on which I find Eckville Shelter. Are you thinking what I'm thinking, Pinky? My Companion claims various snacks, including ice cream, are available on the honor system, but as the caretaker tells me when I inquire about the very prominent sign saying no such thing exists, that information is several years out of date now (another mistake hopefully fixed for next year’s edition). I’ve stopped mostly to get water and read the register before heading on, but I don’t feel much motivation to hike further today. It’s close to ten miles to the next shelter, and while I’m passing through land with easy camping owned by the Pennsylvania Gaming Commission, it’s not clear all of it will be, and that might make finding a space more fun than it has to be. Eventually laziness wins out — particularly when the Honeymooners walk in! Yay for hiking company! They’re on the trail again, having hopped back on at the 309 road crossing sometime after I passed it today. Dinner is a jambalaya package sent in the package I picked up in Palmerton. It’s pretty good, but its not being fully dehydrated adds a bit to its weight. I also get to snack on a pear from the tree in the caretaker’s yard and one of those long flavored ice tubes from the caretaker — much appreciated. Speaking of food, tomorrow should be even more awesome, as I hike past the road toward Hamburg, a short mile down which lie many eating options. The Honeymooners are intent on Cracker Barrel, but I’m looking forward to visiting the Cabelas there (all 250,000 square feet of it) to sample its all-you-can-eat buffet. How have I gone since Monson without all-you-can-eat? I’m a disgrace to thru-hikers everywhere. I get a reasonably early start today, fueled by the thought of all-you-can-eat for lunch. The morning trail passes fairly quickly; there are a few viewpoints, such as this one, but the trail mostly passes quickly, as I’m motivated by what lies at the end of it for lunch. Around typical lunchtime I pass Windsor Furnace Shelter, where I partake of a water jug left there to top off what I’m carrying from Eckville. Silver Potato and Cracker are ahead maybe a day or so; they stopped at a campground on a mile-and-a-half side trail (sheesh, I’d barely even consider going that far off-trail without food and/or a hostel at the end of it) near The Pinnacle to clean up (apparently mostly unsuccessfully). From there it’s back on until Pa. 61 and the road to Hamburg — but more specifically, the road to all-you-can-eat at Cabelas! It’s a quick twenty minutes or so down a multilane divided highway before I reach Cabelas. Cabelas stores, as far as I can tell, all fit the same rough mold: extremely large, usually decorated with various works of taxidermy (accompanied with species descriptions and explanations of how they were acquired, some as world records, others as illegally poached) in some sort of artificial scenery roughly representing the specimens’ natural environment (save for the close proximity of so much other wildlife), lots of hunting and fishing gear (clothes, equipment, and instructional aids), and a much smaller section of camping gear — even less of which is backpacker-oriented. After I stuff myself silly I wander around for half an hour or so to allow contents to settle before shipping. I briefly look at backpacking stoves, but the one or two models they apparently have seem slightly overpriced. I also try to pick up some lithium AAA batteries in the hopes that my headlamp will last longer with lithium batteries than it does with alkaline (they seem to last a little longer, but not that much more, from future experience), but strangely, nowhere in the quarter million square feet of store do they have any. (They have AA and other sizes, but not AAA.) I pass Jessica of the Honeymooners during this time, who basically agrees with my sentiments: Cabelas is not very useful for a backpacker (let alone a thru-hiker likely carrying everything he needs already). Eventually I feel safe going back to hiking, so I head back down the road toward the trail, picking it up for a brief fifteen minutes or so before arriving in Port Clinton. There’s a shelter in town somewhere, but there’s still perhaps an hour of daylight left for hiking, and it’d be great to get further south, maybe catch up to or pass the Honeymooners ahead of me for the night. There’s a spring, Phillip’s Canyon Spring, which seems like a reasonable target that pushes but not too aggressively; we’ll see if I can reach it before dark. After passing by a war memorial and waiting for a train (!) to cross the tracks the trail crosses over, I head back up to the ridge, gaining perhaps a thousand feet or so of elevation in the process. I pass by the Honeymooners, from appearances, as dusk begins to settle. Maybe half an hour later or so I find a nice, small clearing off the east of the trail, just large enough to pull out the new bivy sack I picked up in Palmerton and put it to use; there’s even a nice tree branch nearby for getting smellables up a dozen feet or so. I cook dinner and eat before heading to sleep with the darkness. On a whim I decide to try using just the bivy sack and the clothes I’m wearing, without a sleeping bag, and seeing whether or not I stay warm. This sleeping bag has been overkill for much of the hike, so it’s worth trying to avoid it if I can help it. I wake up near daylight, perhaps 6:00 or so, slightly shivery but not so much that curling up a little doesn’t keep me warm. It’s a little uncomfortable but only in the morning when you have to wake up anyway, and it’s definitely possible to get by without the sleeping bag. I can’t race fall and winter fast enough to not need the sleeping bag at all, but I shouldn’t really need it for awhile. A quick Pop-Tart breakfast later and I’m out and south again; the Honeymooners haven’t passed me yet, but we’ll see how long that lasts. I take longer breaks and hike later into the day than they (and most others) do, so odds are I’ll see them again soon enough. The spring I was thinking I might make yesterday before dark is dry, so my first chance at more water (I last filled up at Cabelas) is, potentially, Eagle’s Nest Shelter. 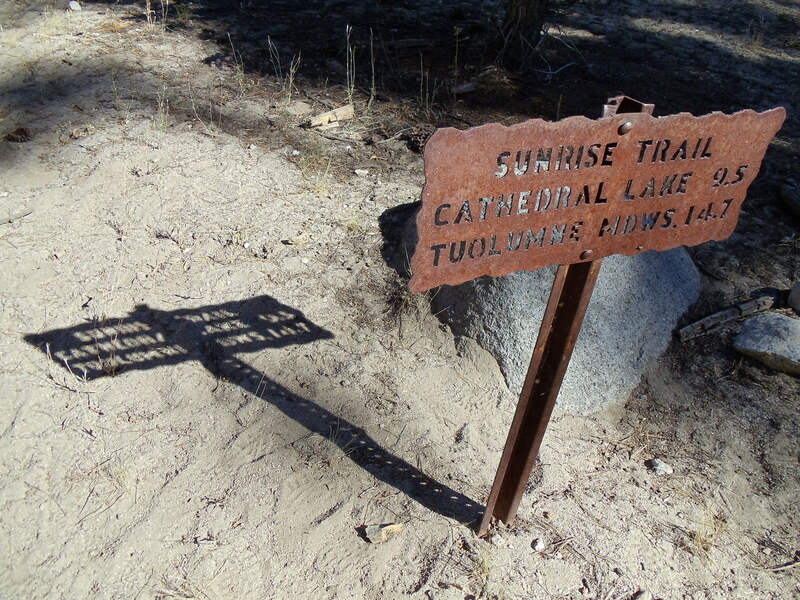 The shelter’s 0.3 miles off-trail, and it crosses a claimed-intermittent spring along the access trail. It seems unlikely the spring will be running given the weather and that dim assessment, and indeed it isn’t. The privy can still be of use, however, so I continue down the trail to the shelter, where I end up meeting Sunday again! The last time I saw him was something like four states ago, in Massachusetts just after Vermont; he’s now hiking with his girlfriend Chloe for a bit. I sign the register and give Sunday the extra lighter I picked up when he mentions he needs one. I decide to wait for them, so we all head out together. On the way out I take a cue from the late-season northbounders and leave a dated note on the access sign saying that Yeich Spring is dry — those notes have been a great help in knowing when not to walk for water. It’s not much further to Sand Spring, which rumor has it is dry, but if you go back further behind it and dig a little you can get water. That’s exactly right, and I scoop up a couple bottles of water with lots of floaties in it — mm, extra fiber. (It doesn’t really matter that much; Polar-PUR iodine will kill anything dangerous in it.) Sunday and Chloe catch up and do likewise, except that they use Aquamira. After this it’s more hiking along the trail to Pa. 183, a short distance after which we reach the Fort Dietrich Snyder marker commemorating a fort which used to be in the area; a side trail leads to a spring that we hope will be good, and indeed it is! It’s a pipe with excellent, clear, fast-flowing water coming out the side of the hill, and we all ditch or drink our previous water and fill up with the good stuff here. I eat lunch as I wait for water to purify; given what I’ve seen around here I should drink as much as I can while I’m here (and leave with as much water in the process of being purified by iodine as well) before heading on. Invigorated by the good water and lunch, I make much better time after I rejoin the trail, rustling up a large (but harmless) rat snake in the process. The trail is still covered in Pennsylvania Rocks!, but they don’t hinder my progress much, and I quickly leave Sunday and Chloe behind me at this heightened pace of around three miles an hour, eventually reaching that almost-meditative state where trail tunnel vision takes care of most of your hiking for you, leaving you time to think about whatever you want. I continue in this fashion, placing one foot in front of the other (metaphorically, not quite physically), when I see something moving near my leading right foot. Something sort of thick and coiled. Time to speed up the pace for a little bit! Half a dozen steps later I turn around and look back to see what the rattlesnake is doing in response to my intrusion upon its space. It’s very clearly a rattlesnake, and it didn’t rattle or even respond to me, as far as I could tell, until I was walking past it. I suspect it was asleep, sunning itself in the middle of the trail, and didn’t even know I was there. The snake is unfortunately not very visible in the picture, but it’s the best I got; my second one didn’t turn out any different or better, and it’s not even worth posting. The rest of the day’s hiking is uneventful. I pass by copious amounts of water at Hertlein Campsite, but I’m still well set from the previous spring and don’t bother filling up. Later on my energy starts to wane, and Sunday and Chloe catch up to me at an overlook a little bit short of my target for the day: the fabled 501 Shelter. 501 is, like Eckville Shelter, a shelter near a caretaker’s house, itself on a road — this time, not surprisingly, Pa. 501. Sunday, Chloe, and I all arrive at around the same time to catch up to the Honeymooners, who naturally would not miss this magical shelter. Why is it so magical? Two words: pizza delivery. The Honeymooners have already ordered pizza (more accurately calzones, as I recall), but they lend the rest of us a phone to place orders. I order a 16″ pineapple and ham pizza, which I now know I can finish without real difficulty. A short time later pizza arrives, after which it’s time to eat. As I eat I skim through the register. Medicine Man passed through around a week or so ago, continuing at his usual super-fast pace; he claims he’s going to hike south 34.9 miles (!) carrying a large delivery pizza to eat at the end of it. 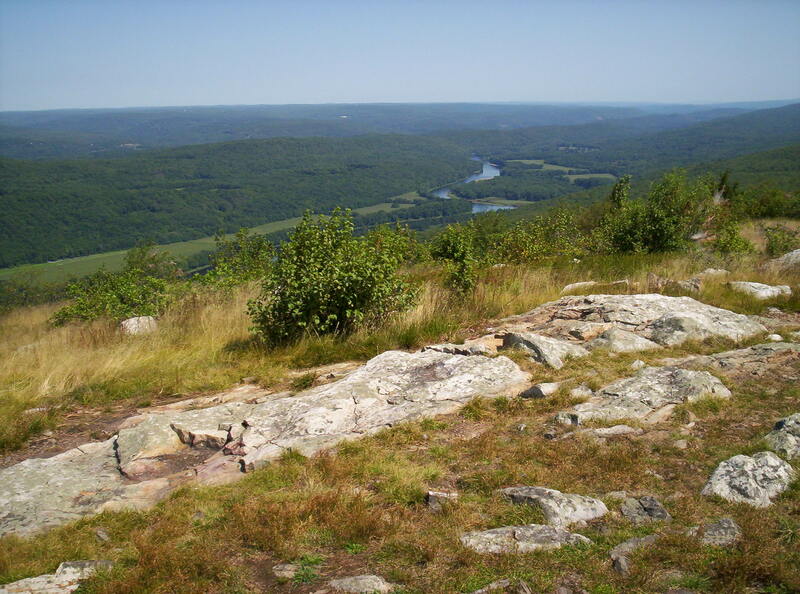 He also leaves a warning for hikers to watch out for snakes, as he says he’s seen something like fifteen different venomous snakes in his last couple days, among the Pennsylvania Rocks! on the trail. Both claims are pretty incredible, but I don’t doubt either of them. (Not everyone hiking through is so cautious about snakes. When I mention Medicine Man’s entry, the Honeymooners relate the story of someone they heard about who didn’t know the snakes in the area were venomous and, er, took a picture of herself petting a copperhead and didn’t know what she’d actually done until she showed it to other hikers who questioned her sanity. Copperheads, unlike rattlesnakes, are fairly docile and often don’t really mind humans — I heard several stories of thru-hikers who stopped at rocky views, leaning against their packs, only to get up and discover a copperhead had nestled itself in the shade between hiker and pack. That still doesn’t change that their venom is extremely poisonous.) Smoothie, who had been hiking with the Honeymooners, is only a few days or so ahead; he stayed alone at 501 and couldn’t get a phone to call for pizza, so he says he settled for Knorr pasta. 🙁 Pizza disappears a little more slowly, and with a little more effort needed at the end, than last time, but I still finish it all. After that it’s time for blessed, glorious sleep in this superb shelter. The Honeymooners are up and out early before I finish breakfast, not surprisingly. Sunday and Chloe head out to 501 roughly around the time I leave. They’re heading into town, so I’m not going to see them again today — or, as it turns out, for the rest of the hike. My pace is definitely picking up, although in this case I think it’s more that I caught up to Sunday at a time when he’d be hiking more slowly than he usually does. There are apparently some claims that Chloe might join him for the rest of the hike — you read that right, all the way to Springer — which seems rather, er, unlikely to happen as such a spur-of-the-moment decision. I doubt this actually happened, but I do remember hearing that Sunday completed the entire trail. Trail progresses quickly and without incident past William Penn Shelter; I decide to make time rather than stopping to read a register. After follows another long and featureless section of trail, 6.9 miles until the trail passes under I-81. As far as I can remember, this is merely the first of half a dozen crossings of I-81 and the trail. (Passage is always either above or under it, never directly across it, to be clear.) The interstate is on overpasses at least a good fifty feet up in the air, also passing over a river at the same time (the trail crosses a much smaller bridge not suitable for anywhere near that much traffic, if indeed any; I can’t remember whether it was open to cars or not, but I don’t think it was). I pass by without giving it much thought; I’m doing well for water and making good time, so there’s not much reason to stop; I already had a brief lunch before the interstate, close enough to hear it but not close enough to see it. By the way, a mile after William Penn Shelter I hit 1000 miles walked. I suppose this is cause for celebration, but to be honest, I’m not entirely sure it even crossed my mind at the time. 🙂 It’s just such an unreal number; what’s real is the next resupply point, the next shelter, the next trail feature, the people ahead of me that I’m trying to catch up to, not some number that has meaning only relative to a point in time months ago. After more featureless hiking, although this time through forests and trees and past a few creeks (water! ), I reach the Rausch Gap area. The trail is temporarily relocated in the area, I believe because one of the bridges needed repairs, although supposedly it’s been fixed now. I follow the alternate-route markings since they’re still around. One of the rivers has a nice sign by it describing the river’s recent history; it was to be made unusable for fishing as part of some industrial purpose, but a local fisherman complained and got enough buy-in from others to rehabilitate the river and make it fishable, fending off the development efforts. The sign describes the technique of how they made the previously-too-acidic rivers (from an excess of pine trees and tannic acid in the surroundings) usable again, involving small dams, deposits of crushed limestone, and natural water agitation to counteract the tannic acid and bring the river’s acidity back to levels where trout could survive in it (they apparently require a fairly narrow pH range to survive). It’s not much further from here to Rausch Gap Shelter itself, where I first head for a privy before stopping at the shelter to read the register and, eventually, make dinner before continuing south further. There are a handful of other hikers, and we talk for a bit on various things as I sit and eat. I discover that Pennsylvania doesn’t allow construction of privies unless they’re above-ground, from what I remember even on private property, so they have to be elevated and store waste above-ground, as it is at this shelter and at previous ones (excepting 501 and Eckville due to their special situations) I’ve seen in Pennsylvania. I also get a little news on the water situation, which should be reasonable down to Duncannon from here. The morning’s hiking today is fairly unmemorable. I’m in a shelter drought for ten miles, so stopping is minimal for much of that time. I first discover that the Companion mileages that I thought were messed up yesterday continue to be messed up; eventually I give up trying to map my progress to the listed features, because the distances between them are just flat-out wrong. (This is fixed in the 2009 Companion I examined for recording unfixed mistakes while at Trail Days.) The good news is that water sources along the trail are fine, so it doesn’t take much effort to water up. Did I pass up Ted‘s offer to visit him? I know he mentioned he was in Pennsylvania. I know he mentioned his general location with respect to the trail. Where was it? I don’t have any idea, and I’ll be 150 miles into Pennsylvania by the end of the day with only 80 left to go, and I can’t find out where until then at the earliest. Things don’t look good, not at all, nope, not a bit. In any case there’s nothing to do about it now; only once I reach Duncannon can I assess my options if I have any. The valley quickly disappears as hiking continues back to the top of the next ridge toward Peters Mountain Shelter, formerly the Earl Shaffer Shelter until he requested its name be changed when a wooden floor was installed (he was an apparent believer in sleeping directly on the ground). This shelter’s known for its water, or more accurately for the trail to water: 300-odd steps down the ridge to a fairly slow source (bring a book along, and use the gallon jugs in the shelter to get as much water per trip as possible). I have plenty of water, so I elect not to make the trip down. 🙂 Among other things in the shelter is a large can of beans left behind by someone. It’s of course the cardinal rule of hiking to pack out what you pack in, but someone seems not to have followed it. What the heck, why not eat it? I’m hungry and it’s a distinct change of pace (because of course I’m not so stupid as to carry over-heavy canned food, even if I’m not particularly weight-conscious), so I open the can, eat the beans, and throw the empty can in my backpack — Duncannon isn’t far off anyway. It’s a welcome change from constant Knorr noodles, although I still would have preferred if it weren’t left there to begin with. By now it’s starting to get late in the afternoon, and I have almost twelve miles left if I’m going to make Duncannon. Back into hiking overdrive I go, and the miles pass quickly at a good three-mile-an-hour pace. I pass over one of the handful of bridges over roads on the trail, built in 2003; the overhead view pretty clearly shows why the bridge was built. I later pass by another shelter, but I can’t really afford to stop even if I wanted to, and a slight drizzle makes me inclined to just keep moving anyway. Finally, after seeing and hearing the Susquehanna River for some time, I start the descent down to it. The path across is the sidewalk on a large bridge; the river’s roughly comparable in size to the Hudson River (passed over back in New York via the Bear Mountain Bridge). Due to a misreading on my part I think that I have an extra mile to walk in town to reach the Doyle, so I move at a fast clip through town, where the trail winds several miles over roads for the rest of today and the start of tomorrow. The turn just preceding the hotel thus occurs abruptly, but it is welcome as the expected extra walking would have me going past dark. The Doyle itself is an interesting place; there’s a small bar downstairs, and a couple floors upstairs have the rooms themselves. 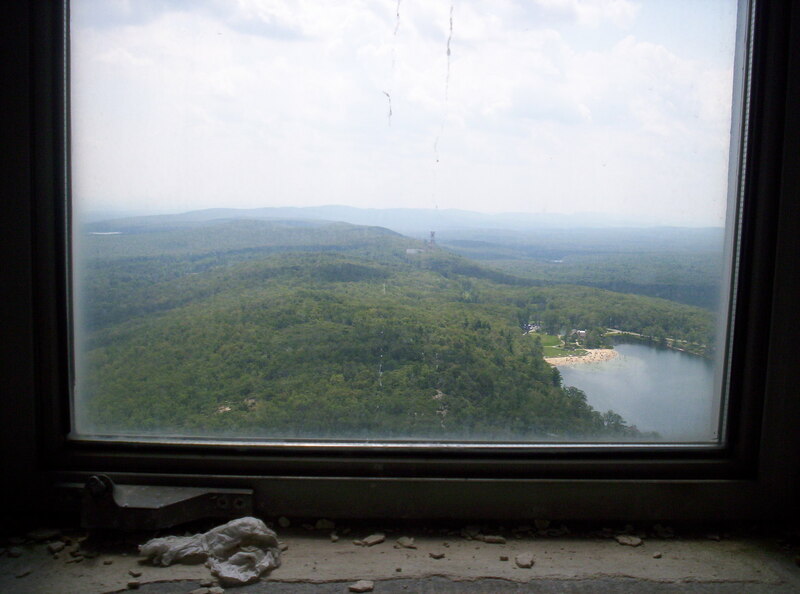 It has a reputation for not being exactly the cleanest, best-kept-up hotel; some hikers even explicitly avoid it. At $25 a night you know it’s not going to be the ritziest place, but it works fine for me. (Anyone who knows me knows I’m far from picky!) From what I understand the current owners are making an effort to clean it up, and comparing past stories against what I saw it definitely shows. It’s not the greatest place (the website in one place says, “Still trying to improve the Doyle. Please be respectful when here.”), but in my opinion people who don’t stay are missing out, and people who intentionally avoid it are making a huge mistake. I quickly grab a shower before heading back down to get something to eat, where I find that I’ve caught up to both the Honeymooners (expected) and Silver Potato and Cracker (not quite as expected). My dinner is chili, an excellent shrimp jambalaya, and a Guinness, which I eat while everyone talks. There’s also a Phillies-Cubs game on in the background, although we don’t pay much attention. Silver Potato and Cracker are as little enamored with the Pennsylvania Rocks! as the rest of us, even less so than the Honeymooners or me in that they don’t respond when I say I think northbounders are wimps for calling Pennsylvania difficult rather than annoying. Cracker’s counting down the days until she’s out of the state, much like I was early on until I’d reach Glencliff and be out of the mountainous part of the trail. I use the computer down in the bar to check email and discover where Ted was; it turns out he was near Palmerton and I missed him. :-\ Before wrapping up I get a little detergent for washing clothes in the machines upstairs, and I find out the restaurant Goodie’s across the street serves a good breakfast for tomorrow morning. Checkout time is 11, plenty late enough for me to take my time tomorrow morning getting out; I’ll definitely be sleeping in. Yay for my own bed in my own room!